Understanding Brahms and his place in the lexicon was a subject of a panel on Saturday afternoon at the Garden Court Hotel in nearby Palo Alto. Brian Newhouse, director of Minnesota Public Radio, moderated the discussion between David Finckel, co-artistic director of Music@Menlo along with pianist Wu Han, and Patrick Castillo, artistic administrator. Finckel described that evening’s concert. “The great lineage of classical music, from Bach on up through Mozart and Beethoven, was like a train. Brahms rode the train all the way to the end of the line. After him, everyone just got on buses,” referring to the scattered directions that ensued, from Serialists and Neoclassicists to Spectralists, and from jazz progressions to polytonal harmonies, and thence to electronic. But the audience seemed to prefer gossip on Clara and Johannes to brain cleanses. Though scholars speak of their deep friendship and support during Robert Schumann’s descent into madness, the less scholarly make much of their artistic triangle. But Clara’s musical influence on Brahms was undeniable, and her Piano Trio in g minor was smoldering. At that evening concert, young Finnish piano star Juho Pohjonen anchored Clara Schumann’s deeply romantic trio, with Yura Lee on violin and Eric Kim on cello. And it did seem florid, as if each note were held in the mouth before taking shape in the air. Pohjonen set the structure, fierce attacks and huge line, and the strings echoed and answered. Though she hoisted a viola through the rest of the program, here Lee played violin—but still displayed an exceptional lower register. The cello gave back heartfelt responses, especially in the third movement. According to Castillo’s program notes, those strings could be thought of as a love duet for Clara and Robert, as violin and cello respectively. But what of the “real” Clara? She was one of Europe’s leading pianists, and the powerful piano line was also her voice. The trio mirrors the multiple roles she inhabited, from loving wife to Robert and mother of their children to artist and composer. Her limited output was most certainly a product of her straitjacketed era, and in a kinder age she may have flourished. After intermission, we reconvened for Brahms’ Sextet in B-flat Major, Op. 18, scored for two violins, two violas and two cellos, weighted in the lower octaves for an earthy and serene flavor. Festival favorite Paul Neubauer joined Yura Lee for a powerful viola duo, while cellists Eric Kim and Lawrence Lesser worked the cello octaves. Kim gave his middle register the chesty quality of a bassoon, and Lesser added bottom-of-the-pot gristle for a meaty stew. And yes, Bach cleansed our brains, starting the concert with a lovely trio that featured flutist Sooyun Kim. While living with the Schumanns, Brahms had a window seat on Romanticism, with Robert’s fevered utterances and Clara’s gentler heat and emotional directness. He spent decades editing those feelings into the pithy art of German Lieder, short songs set to the love poetry of his time. The following Tuesday’s concert was filled with drama, appropriate for that subject: soprano Erin Morley lost her voice Monday afternoon and the festival went into high gear searching for a last minute replacement. Canadian soprano Katherine Whyte flew in Tuesday morning after a flurry of phone calls across the US and Canada: they needed a high level voice that knew the music intimately. Most challenging was the Alban Berg, whose seven songs are as emotionally enticing as they are atonal. Whyte carried them off, sliding from song to near-speech and back, and particularly affecting in “The White Chrysanthemums,” where she sang gently of Flowers and Maidens and Death. Then baritone Kelly Markgraf found his voice going, too, perhaps from Morley’s bug. But he persevered and took part in the vocal quartets, deleting only his solo set. Though his voice was held back, it was magical. Despite the jittery prelude, that concert also had stunning performances by mezzo Sasha Cooke and tenor Paul Appleby. Cooke, who burst onto New York’s Metropolitan Opera scene as Kitty Oppenheimer in Dr. Atomic, sang Brahms’ Zwei Gesänge with burnished voice and completely natural diction. Neubauer circled her lower register with supple viola, then prepared the way to the lullaby with a solo. Voice and viola held distinct lines with unexpected harmonies, a complex language in a simple form and full of Brahms’ gentle spirit. Appleby swelled from the closed silver vowels of German into golden belling, a perfect vehicle for Franz Schubert’s lieder. They closed out the night with Brahms’ “Liebeslieder Waltzes,” each of the four holding their own lines with confidence. Particularly gorgeous was “The Green Hop-vine,” melding sweet melody with dark lyrics. And that contrast may speak to the core of the night’s beauty. Photo top of violist Paul Neubauer and mezzo-soprano Sasha Cooke, August 2, at the Center for Performing Arts at Menlo-Atherton. 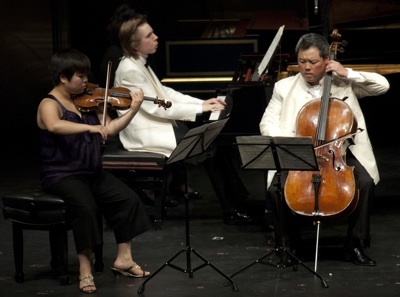 Photo bottom of violinist Yura Lee, pianist Juho Pohjonen and cellist Eric Kim from the July 30 concert; photos by Ashley Pinnell.